We all have a bad habit or few that we know we should stop but haven’t managed to yet. A bad habit is anything that negatively impacts your health and wellness or the health and wellness of others. Oral bad habits are common. It is likely that you will be guilty of at least one of the habits on this list of habits that need to be broken. You know what they say though, there is no time like to present to kick a bad habit and replace it with a good one! Brushing too hard, especially with a firm-bristled toothbrush can cause the enamel to wear away on the surface of your teeth over time. Without this protective layer, you are more prone to tooth sensitivity and cavities. Opt for a softer bristle toothbrush and take your time brushing your teeth using a gentle circular movement on each tooth. While brushing your teeth at least twice a day is crucial for maintaining a healthy and clean mouth, your toothbrush isn’t capable of cleaning out those tight hard to reach spaces between your teeth. If you don’t floss, you are only removing around two-thirds of gingivitis-causing plaque from your teeth. Grinding your teeth is very harmful to your oral health. Grinding can cause your teeth to chip or crack, the protective enamel layer to wear away, and can cause muscle tenderness, joint pain, and headaches. If you are a chronic grinder, make sure you talk to Dr. Blake or Dr. Steve about some easy solutions to break this habit. While we’ve all accidentally bitten the side of our cheeks at least once before, habitually biting your cheeks is problematic. Whether this occurs due to misaligned teeth or as a nervous tick, this habit can lead to mouth sores and serious infections. It is speculated that cheek biters are more prone to developing oral cancer too. The skin on your lips is much thinner than the skin on the rest of your body. For this reason, it is more susceptible to chipping, cracking, environmental damage, and early signs of aging. It is essential to keep your lips moisturized and protected from the sun on a daily basis. We live in an era of choices. There are dozens of toothpaste brands and types readily available for all different concerns and flavor preferences. While some toothpaste may claim to “control tartar,” be careful that the toothpaste you are using isn’t too gritty. Some “tartar control” toothpaste are too abrasive and will erode the enamel on your teeth and can cause receding gums. The most critical ingredient in your toothpaste is fluoride. The rest is all personal preference. Your teeth are not intended to be used in place of scissors or nail clippers. Stop using your teeth to open packages! Using your teeth for anything other than eating puts you at a higher risk of chipping a tooth, injuring your jaw, and swallowing something inedible and harmful. Bad, bad, bad! Crunching hard candies and ice is a recipe for disaster! This hard habit, especially when done over a long period can lead to chips or cracks in your teeth and damage existing dental work. Carbonated sodas contain phosphoric acid, which over time can erode your teeth. Sodas contain excessive amounts of refined sugar, as well which is not healthy for your teeth or your body. The artificial sweeteners in diet sodas have negative impacts on your overall health, as well. It is time to learn to love water! If you do drink a soda though, make sure you brush your teeth afterward. Smoking is good for nothing! 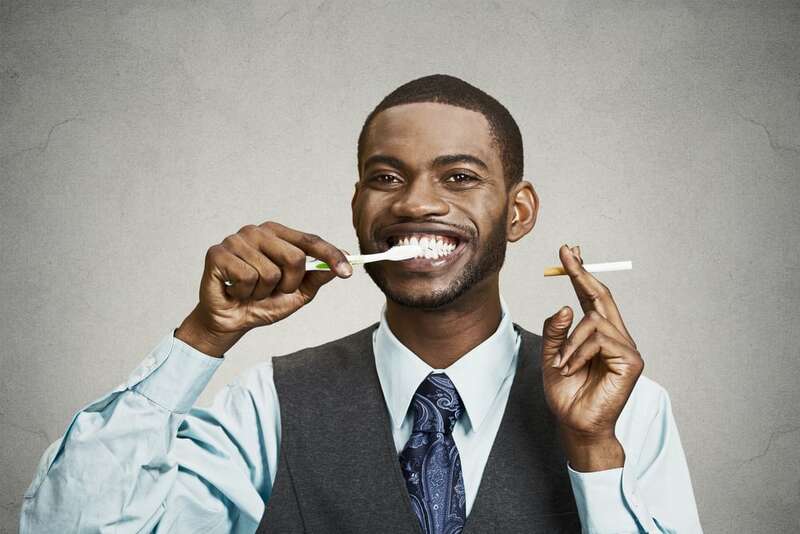 Aside from significantly increasing your chances of developing oral cancer, lung cancer, heart disease, emphysema, and painful lesions in the mouth, smoking also reduces your sense of smell and taste, contributes to bad breath, stains your teeth, increases your chances of losing your teeth, and can cause your gums to recede. Don’t ignore symptoms like bleeding gums, bad breath, pain, or sensitivity in your mouth if it lasts more than a few days. It is far easier to treat a condition when it is addressed in the early stages. At Parker Dentistry, we are always here for you and always just a phone call away.